You want to stay active! You want to stay in New Hampshire for the winter! You are not ready to sleep away the winter though, you want to stay active all winter long. There are many animals that are active during the winter in New Hampshire. Some animals adapt and change for winter time. 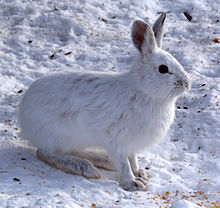 The Snowshoe Hare is a rabbit in New Hampshire that actually changes color for winter time! In the summer, the rabbit is brown, but for winter it changes to a white! Another animal that is happy to see snow are deer! Because food is harder to find in the winter deer find different things to eat, even eating moss, twigs, bark, and leaves to eat! Because there is not as much food, deer are more active in the fall, but they still like to play in the snow! Moose are one of the warmest animals in the winter. A baby moose is comfortable in temperatures as low as -22 degrees! Their fur is specially designed to make cold weather very warm. They actually spend so much time in the woods during the winter to stay out of the sun and to stay cool!